Hazare had started his agitation on January 30 over “non-fulfilment of promises” by the Centre on appointment of Lokpal and pro-farmer reforms. ACTIVIST Anna Hazare ended his hunger strike on its seventh day following a marathon six-hour meeting with Maharashtra Chief Minister Devendra Fadnavis, Union Agriculture Minister Radha Mohan Singh and Union Minister of State for Defence Subhash Bhamre on Tuesday. He said he was satisfied with the promises made by the government and decided to break his fast. “I’m satisfied with the promises and, hence, I want to break my fast. I had started the fast as I was pained that even though five years have passed since the Lokpal and Lokayuktas Act was enacted in 2013, the Centre did not appoint a Lokpal. Also, I’m confident the new joint drafting committee for Lokayukta Act for Maharashtra that the government has agreed for will come up with a model draft…,” Hazare said. Hazare had started his agitation on January 30 over “non-fulfilment of promises” by the Centre on appointment of Lokpal and pro-farmer reforms. The Centre had started efforts to ease the situation by sending Bhamre to hold deliberations with Hazare on Monday, but failed to satisfy him. On Tuesday, Singh and Fadnavis held closed-door deliberations with Hazare, helped by agriculture experts Sompal Shastri and Popatrao Pawar. The deliberations started at 2.15 pm and continued till 7.40 pm after which Fadnavis emerged from the Yadavbaba temple, where Hazare had been fasting, and announced to the media that the government had managed to satisfy Hazare on all counts. Fadnavis said the government had agreed to his three main demands, including appointment of a Lokpal; enacting a new Lokayukta Act for Maharashtra to replace the existing act, which as per Hazare doesn’t have enough teeth, and giving autonomy to the Commission for Agricultural Costs and Prices. “On Lokpal appointment, we handed him a letter from the PMO that the search committee will hold its meeting on February 13 and start work to appoint a Lokpal as per Supreme Court directives. We also agreed to form a joint drafting committee, with civil society nominees by Hazare, for a new Lokayukta Act for Maharashtra. This draft will be presented for approval in the upcoming Assembly session. For demands related to agriculture such as granting autonomy to the Commission for Agricultural Cost and Prices, adopting C2+50 formula to decide minimum support price, deciding prices of perishable farm produce, it was promised that a committee under the chairmanship of the agriculture minister will be formed, which will have Sompal Shastri as Hazare’s nominee and some members from NITI Aayog to deliberate and submit recommendations,” Fadnavis said. 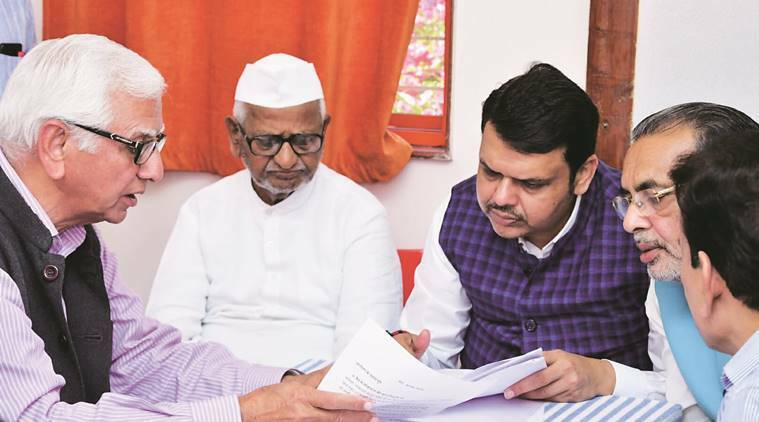 Fadnavis said Hazare also demanded that the direct transfer benefit amount in the recently launched Pradhan Mantri Kisan Samman Nidhi scheme, in which farmers with less than two hectares of land will be given Rs 6,000, should be increased.